You know it's Chinese New Year time when you see lap ngap (waxed duck)! 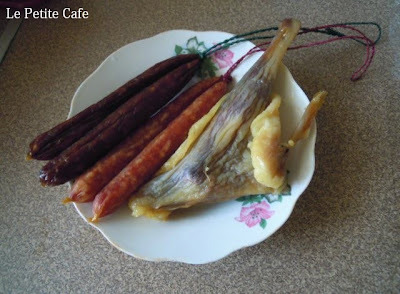 It is a delicacy available and eaten during the Lunar New Year. Made by preserving a flattened, deboned duck in salt, spices and fat, it's extremely salty and leathery. 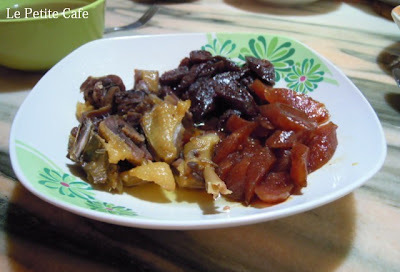 Lap ngap pei (wax duck's thigh) is the one on the right. On the left is lap cheong (chinese sausage) which is available all year round. These meats are usually cook by steaming. But before that, soak the lap cheong in hot water to loosen the skin so that it's easy to peel it off. In Lap mei fan, the meats are cook together with the rice in the cooker. The oil/fat from the meats give flavour to the rice. It's oily and definitely not healthy but taste so good!